All pre-registered finishers are eligible pick up their souvenir patch at the Finish Line swag table recognizing their participation. Race Day registrants are not guaranteed a patch or a T-shirt, but may be able to pick up a patch and purchase a T-shirt at the Finish Line, depending on availability. Awards for the competitive classes will be presented at a Finish Line ceremony at 3:00 pm the day of the event. 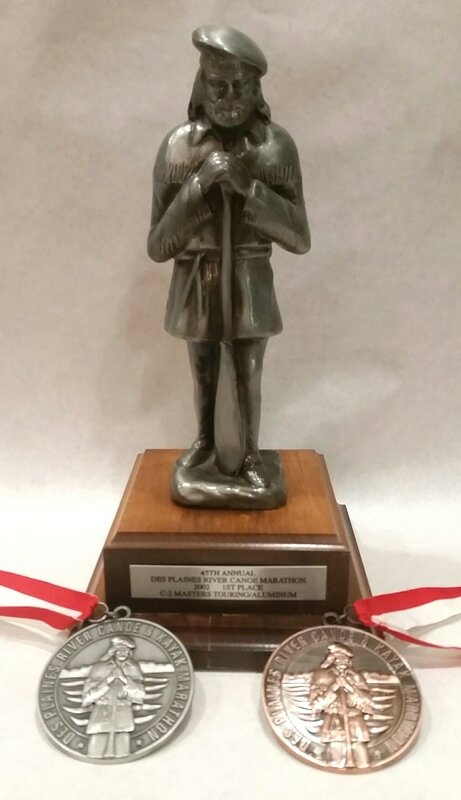 Winning paddlers in all racing classes with six or more craft pre-registered by midnight on May 11, 2019 will each receive an historic 10-inch high Voyageur figurine trophy, in recognition of their achievement. (Open Class note: there will be a maximum of two Voyageur trophies per craft.) Second and third place finishers will receive medallions. Racing classes with five or fewer competing craft pre-registered by midnight on May 11, 2019, will be awarded medallions for first, second, and third place finishers. Unsurprisingly, there are no "winners" awards for the non-competitive classes No Contest and Minithon. Awardees will be notified within several days following the event and will receive their plaques by mail. These awards are in recognition of continued strong showing relative to peers of all ages in a class. One award will go to a solo paddler whose percentile finish in his or her Marathon Class is highest among all solo competitors over 70 years of age on race day. The second award will go to the tandem paddler whose percentile finish is highest among C2 or K2 paddlersover 70, regardless of who their partner is. Be smart, pre-order a T-shirt for $7 and pick it up at the finish line swag table. Shirts may be purchased for $10 at the finish line on the day of the event, sizes and quantities are not guaranteed. Official results will be posted on the canoemarathon.com website within a few days of the race. Several past years race results are available as downloadable spreadsheets here: 2017, 2016, 2015.